Skin Purging vs. Breakouts: What’s the Difference? Skin purging occurs when a new skin care product causes a breakout—a result of an accelerated rate of exfoliation. Over-the-counter and prescription products containing retinoids or hydroxy acids increase cell turnover and can be responsible for skin purging. You can prevent skin purging when trying a new product by introducing it slowly or avoiding certain ingredients. Have you ever tried a new skin care product only to experience a full-blown breakout? Your first instinct may be to immediately throw it out—but don’t. This may be a sign that you’re actually experiencing an unusual, but ultimately beneficial skin purge. Once past this stage, chances are you’ll have better skin than ever. Simply put, skin purging is a worsening of your skin condition brought on by a change in your skincare regimen that’s causing an accelerated rate of exfoliation. Certain products—primarily acne treatments, but also anti-aging products—require an adjustment period before they can provide the expected results. These products encourage a faster cell turnover rate, resulting in a faster pimple formation cycle. Purging forces existing pimples to mature quickly. If you have clogged pores, they may turn into pimples and active acne. If you have small pimples, they may develop into large ones. This initial breakout usually clears up within two to six weeks before the skin finally improves. So if you would normally have several pimples over a period of time, you may find your face erupting angrily with many. While it may appear as if your skin is having a negative reaction, this may not be the case. After a while, it’s likely that your skin will adapt to and respond positively to the new ingredients. According to polls, dermatologists agree that skin purging is a real occurrence, and that some products accelerate the renewal process. However, there are some myths and misconceptions surrounding this phenomenon. You may have heard that the purpose of skin-purging products is to help rid the body of toxins that cause acne, sensitive, oily or dehydrated skin, and allergic reactions. As the toxins exit the skin’s pores, they allegedly trigger breakouts. The problem with this logic is that no topical treatment will help the body eliminate toxins—the kidneys and liver do that job. Some beauty experts claim that skin purging only affects people with sensitive or acne-prone skin. In reality, dermatologists believe purging can be experienced by all skin types. Such common products as Differin (a topical retinoid) and Tretinoin (with topical retinoic acid) are examples of topical skin care medications that may trigger purging. If you want to avoid the possibility of skin purging, be wary of any product that promotes skin cell turnover or products that are exfoliative in nature. These include chemical peels, laser treatments, microdermabrasion, and facial exfoliants such as scrubs, brushes, and enzyme exfoliants. According to Lab Muffin, a science-backed beauty blog, “most other products like moisturizers, cleansers and sunscreens won’t cause purging,” so there’s nothing to worry about in those cases. Other than reviewing the ingredients of a newly purchased skin product—cream, mask, cleanser, or serum—you can also do some investigating to determine if you are experiencing a purge or a breakout. Skin purging usually causes breakouts to occur only in the areas where a new product has been applied. An example of this would be if you use a new spot treatment with purging ingredients on only one part of the face and you notice pimply, sensitive skin in that region a few days later. However, if you notice that your acne has become worse on other areas of your face and body, chances are you are dealing with a regular breakout. The length of a breakout is another factor to consider. Usually with purging, breakouts come and go relatively quickly due to the fast turnover process. In contrast, typical blemishes—pimples, blackheads or cysts—tend to linger and worsen over time. If your breakouts last longer than three months, the new acne you are getting is probably not from purging. Also consider that you may be experiencing a regular breakout if you try a new product containing Shea butter, silicones, and oil, as these may clog pores. For skin care products containing lactic acid, salicylic acid, glycolic acid, or retinol, it is recommended to stop using the product entirely if you are still experiencing breakouts after six to eight weeks. And if your product does not contain the above ingredients, then stop sooner—your skin is most likely sensitive to the product itself. Signs would include redness, itching or irritation. Before incorporating a new product with skin renewal ingredients into your skin care routine, use caution. Introduce the new product slowly, by first using a product with a lower concentration of the active ingredient. You can also start with a smaller amount, use it less frequently, or wash it off after a few minutes before gradually increasing to the recommended usage. You may also choose to completely avoid products that promise to speed up the turnover process or deeply exfoliate the pores. Consider using alternative acne-busting treatments that don’t contain the ingredients that might trigger a purge. But note that some alternative treatments, including chemical peels, also cause the pores to purge, and many people experience temporary breakouts after a peel. » Looking for the best professional chemical peel near you? Find a cosmetic specialist in your area and book your consultation today. Skin purging is a condition recognized by board-certified dermatologists. It is associated with the use of specific products and ingredients, so you have the ability to effectively avoid and prevent a purge. Keep in mind that while a new product may cause your skin to purge, it may be worthwhile to wait out the breakout to determine if the product can deliver clear, flawless skin once your skin has adjusted to your new regimen. Out with the old and in with the new. Skin purging helps to increase cell turnover and works to reduce dead skin cell buildup over time. When combined with your skincare regimen, the following products help to promote skin purging and fresh skin. Lactic acid is an alpha hydroxy acid (AHA) that is ideal for those with sensitive skin. When used once or twice per week, lactic acid can slough away dead skin and increase your skin’s hydration. 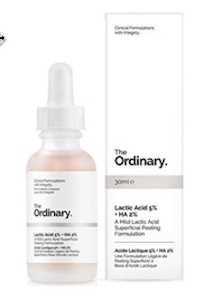 The Ordinary’s Lactic Acid superficial peel uses 5% lactic acid, which is ideal for home use. As with all skincare products, it is important to test this treatment on a small patch of skin before applying it more broadly. Glycolic acid is another AHA that can help promote skin purging. 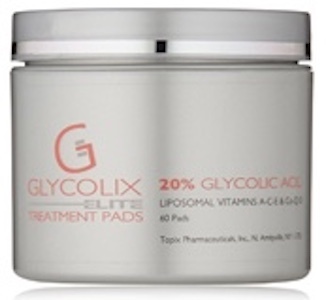 Glycolix’s treatment pads use the power of glycolic acid as well as vitamins A,C, and D to smooth skin and shrink pores. For optimal results, these pads may be used every second night or less if irritation occurs. 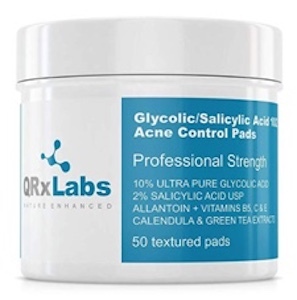 QRx Labs’ pads combine 10% glycolic acid with 2% salicylic acid for a two in one skin care solution. Salicylic acid is a beta hydroxy acid (BHA) that helps to manage pimples and exfoliate skin. These pads are specially formulated to target acne and are perfect for encouraging skin purging. Retinol is a form of vitamin A that can be used in conjunction with AHAs and BHAs for multilevel skin purging. LilyAna’s cream uses retinol, shea butter, and jojoba oil to manage sun damage, stretch marks, and scaring. Best of all, this cream can be used nightly to help encourage healthy skin production. Benzoyl Peroxide is above all an acne treatment. This body wash helps to promote skin purging and kills acne causing bacteria in the process. With semi-regular use, results should begin to appear within six weeks time.